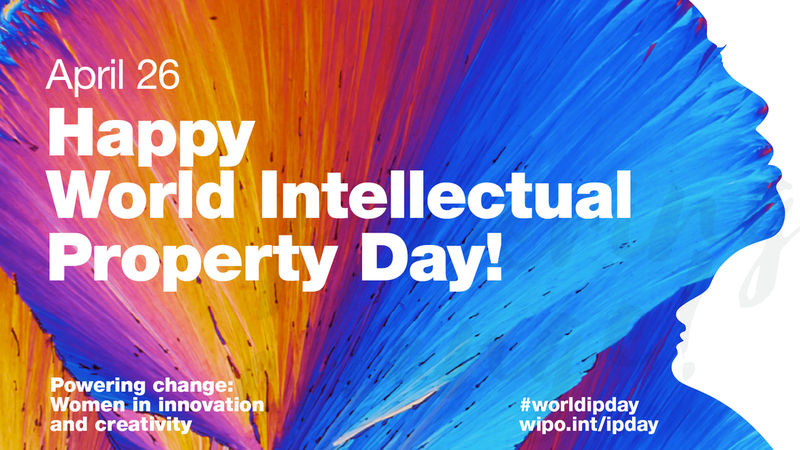 Today it’s World IP Day, and who better to turn to for comment than our own Intellectual Property Office, which does so much to promote intellectual property and the UK’s IP professionals? Eleanor writes: “​Research from the IPO shows that women inventors in science, technology, engineering and mathematics industries are still massively under-represented in the workforce. I am a woman in STEM and a trade union rep with Prospect, which represents workers in many STEM employers. For me, this study demonstrates that while much has been achieved in reaching gender equality in STEM industries, there is still much to do.Analysis of the classifications applied to each patent application also shows that the highest proportion of female inventors are in stereotypical areas such as brassieres, corsets and other clothing, cosmetics, furniture and food. The lowest proportion are in areas such as weapons, engines and tools. The report is especially interesting because much of the statistical research looking at Women in STEM has relied on ‘inputs’, such as the number of women employed in any industry. The IPO report is one of few to provide data on the ‘outputs’ or work undertaken by those women. The study shows that the world of patenting remains male-dominated, with 88% of all GB patent applications coming from teams of all-male inventors. 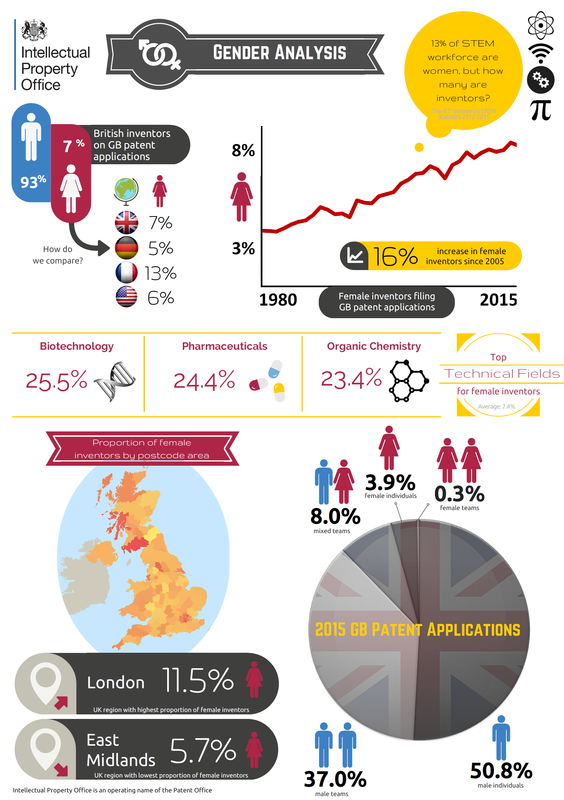 chemistry, biotechnology and pharmaceuticals were the STEM industries with the highest proportion of female inventors seeking GB patents, according to analysis based on the World Intellectual Property Organisation’s international patent classification. ​The recent publication of gender pay gaps by large UK employers has highlighted that women are paid less than men in every sector of employment, though the picture is worst in construction and finance, sectors in which women are also under-represented. The figures highlight the impact on pay of gender segregation of the work force, both by seniority and by type of work. Prospect have produced an e-learning module that supports our members in tackling pay gaps with their employers. It’s free for anyone to use to learn more about the issue. Progress has been slow, but I am undismayed. There is much that we can do, as individuals and collectively within our workplaces. Firstly, let’s make sure that girls and young women see STEM careers as suitable for them. I have seen a number of initiatives seeking to achieve this (starting with those aimed at me when I was at school!) but was really excited to attend the launch of the IP Inclusive “Careers in Ideas” scheme earlier in April. The event was full of practical ideas to make a difference: running careers or science days in schools, sharing the Careers in Ideas materials or finding work experience opportunities for young people where we work. I hope that over time these activities will open up careers in IP to a much more diverse range of people. Prospect has also done some work in this area – running a careers event highlighting several of our women members who work in male-dominated roles for a local primary school. Secondly, we need to make sure that work in STEM fields really is accessible to women and other under-represented groups, and that once they get work it is rewarding and they can progress their careers. IP Inclusive’s Charter for employers in IP is a brilliant way to show commitment to this, and I’m proud that my employer, the IPO, has supported the initiative from the start. It can be hard for employers to know what women need to be able to be successful at work, so Prospect surveyed our women members working in STEM to ask them about their experiences. We found that the cost of childcare and inability to access flexible working options without damaging career progression were significant issues, and worked with the Institution of Engineering and Technology (IET) to produce guidance for employers on recruiting, promoting and keeping women in STEM roles.